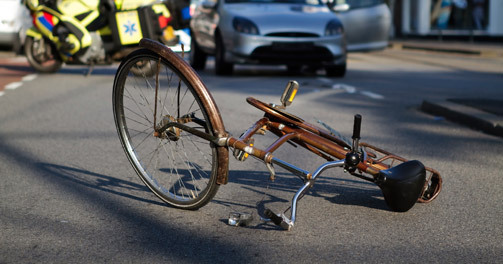 Los Angeles Bicycle Accidents Law Firm | The Goel Firm, P.C. According to the most recent National Highway Traffic Safety Administration (NHTSA) statistics, 677 pedalcyclists were killed and an additional 48,000 were injured in motor vehicle traffic crashes in 2011. Pedalcyclist deaths accounted for 2 percent of all motor vehicle traffic fatalities and made up 2 percent of the people injured in traffic crashes during that year. These statistics include bicyclists and other cyclists including riders of two-wheel nonmotorized vehicles, tricycles, and unicycles powered solely by pedals. The number of pedalcyclists killed in 2011 was 9 percent higher than the 623 pedalcyclists killed in 2010. Most fatalities and injuries occurred in urban areas. Not surprisingly, California ranked second in the nation for most pedalcyclist fatalities in 2011 with 114. Across the nation, the average of cyclists killed in accidents has increased from 36 in 2002 to 43 in 2011. This is in part due to more adults choosing to bike rather than drive because health and financial reasons. Many choose biking as a healthy outdoor activity, and others choose it as a more financially feasible way to commute to work and elsewhere. However, due to road dangers and distractions in urban settings, bicycling can be a dangerous form of commuting. With rising fuel prices and the rise in health consciences, fatalities and injuries in bicycle accidents will no doubt continue to be a concerning figure. As a safety precaution, all bicyclists should wear properly fitted bicycle helmets every time they ride. A helmet is the single most effective way to prevent head injury resulting from a bicycle crash. Common serious injuries from bicycle accidents include but are not limited to (1) serious abrasions or road rash that can lead to possible infection, (2) fractures, (3) head trauma, (4) Severed limbs, and (5) spinal cord injuries. Moderate and serious injuries sustained in a bicycle accident can lead to significant medical bills. For example, hospitalization at a trauma center for a head injury can cost hundreds of thousands of dollars. An attorney dedicated to personal injury and bicycle claims will help you recover the costs for any hospital stay, surgery, doctors’ visits, diagnostic tests, physical and rehabilitative therapy, and chiropractic care. You may further be entitled to the costs of future medical care, if your injuries from the bicycle accident require ongoing treatment. A bicycle accident may inflict a wide range of injuries, whether they are temporary, longer-term, or permanently disabling. The law allows for compensation for the pain and suffering associated with such accident injuries, yet it does not provide a fixed formula to calculate that type of compensation. To recover the maximum amount that your injuries warrant, one will need the help of a dedicated bicycle accident attorney who is equipped with the knowledge, resources and experience to best evaluate your claim. Time lost at work due to injuries inflicted by such a bicycle accident can be significant and have serious ramifications on your finances and family responsibilities. If your accident injuries prevent you from working, then all your lost wages may be included in a claim for recovery against the negligent party and the liable carrier. Even if you used sick leave or vacation time during the recovery period, reimbursement may be available in your recovery. What if your injuries leave you permanently disabled and unable to work ever again? With the use of the firm’s experts, a bicycle accident attorney can calculate your future losses and recover for your diminution in lifetime earning capacity. Loss of consortium is a cause of action that may be brought by a spouse of the injured party for loss or harm he or she suffered as a result of bodily injury caused to the injured spouse by the negligent party. Such a claim can be asserted in a bicycle accident case. If a bicycle accident resulted in the death of a party, then there may be a cause of action for wrongful death. In California, a wrongful death action arises in favor of certain statutory outlined survivors of a decedent of an accident. The survivors who are entitled to bring a wrongful death claim include but are not limited to the decedent’s surviving spouse, domestic partner, children, or issue of deceased children. (1) Call the police and file an accident report. Filing such a report will help document the event and provide important details regarding the accident, such as road and weather conditions, the chain of events, and witness information. (2) Receive prompt medical attention for yourself or anyone involved in the accident. Usually injuries from a bicycle accident require emergency care, so immediately call an ambulance for transport to a hospital. If the injuries do not require emergency, visit a medical care center or arrange to be seen by your regular physician. Some bicycle accident injuries, including serious ones, may be latent and hence it is essential to be examined by a medical care provider as soon as possible. (4) Do not give any statements to any insurance company representatives about the accident without first contacting a Bicycle Accident Attorney. (5) Immediately contact a dedicated Bicycle Accident Attorney. It is crucial to immediately seek counsel so that any evidence available is immediately and appropriately gathered before it is lost or destroyed, and that any possible witnesses are found and interviewed while their recollections are still fresh and useful.